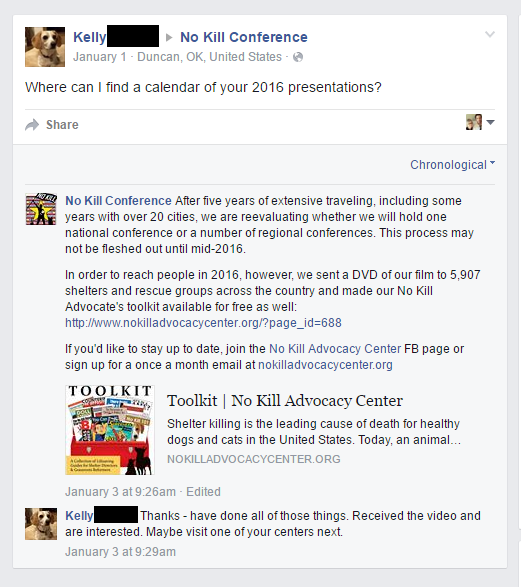 Is the No Kill Advocacy "Center" Just One Delusional Guy in California? ​Surprise! The No Kill Advocacy Center (NKAC) is a California-based one-person "organization" whose "headquarters" is a post office box in a UPS store in Oakland. According to NKAC's most recently available IRS Form 990 (2014), the "organization" has no local chapters, branches, or affiliates. Not one. The entity's "director," Nathan Winograd, is a self-aggrandizing character who actually denies the existence of an animal overpopulation crisis. He claims that overpopulation is a myth and refers to it as "the lie at the heart of the killing." He preaches this nonsense despite the fact that each year, approximately 7.6 million animals enter shelters across the U.S. and that countless others are abandoned to fend for themselves when shelters won't take them in. Try telling those animals they don't have a problem. Because no agency tracks such statistics, no one knows exactly how many cats and dogs roam the streets of the U.S., but the situation is so out of control that estimates for cats alone reach upwards of 70 million, and in towns like San Antonio, Texas, and Detroit, the deaths of so many cats and dogs on the street are collectively described by anti-cruelty law-enforcement officers as "euthanasia by proxy." I'll Fill You in on a Little Secret, Kelly, There are NO "Centers." Did you know that Nathan ​Winograd and his family live in a million-dollar house? In 2014, he was paying himself a salary of $60,000 out of No Kill Advocacy Center funds. NKAC also paid his $16,137 payroll-tax bill. Some years, over a quarter of the NKAC's total revenue has been used to pay Nathan Winograd's salary. On NKAC's 2014 Form 990, in response to the question that asks whether the process for determining compensation of the organization's CEO, executive director, or other top management official includes "a review and approval by independent persons, comparability data, and contemporaneous substantiation of the deliberation and decision," Winograd responded "No." In other words, he decides what to pay himself and feels no need for impartial input into the decisions that allocate NKAC's resources. This is corroborated by a disclosure on NKAC's 2013 Form 990 showing that Winograd used NKAC money to pay a private production company to make a film about himself (which he wrote, produced, and then personally promoted with a year-long tour). On the 2014 Form 990, moreover, Winograd reports spending thousands of dollars of NKAC money each year on "office expenses," even though he does not run an office. Winograd is the only official listed on NKAC's 2014 Form 990—despite the form's requirement to "list all of the organization's current officers, directors, trustees … regardless of amount of compensation." 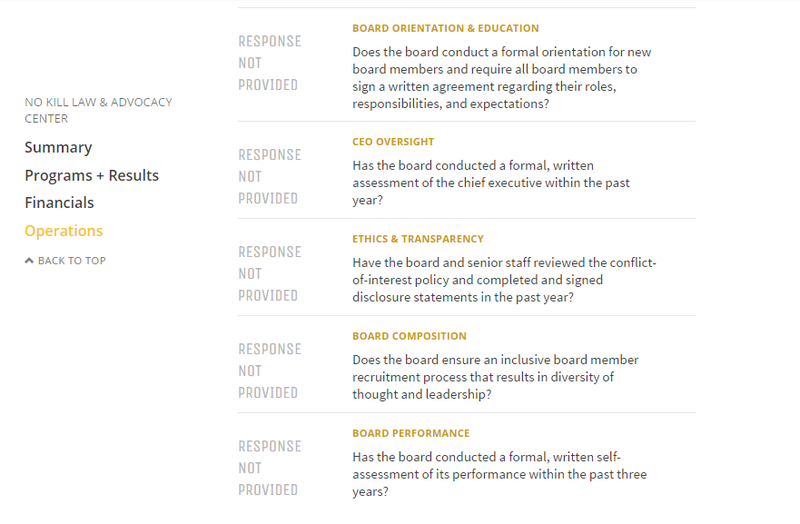 A supplemental portion of the form indicates that Winograd's wife is a "board member," but information supplied in the "Governing Body and Management" section of the form provides no clue as to whether NKAC actually has a functioning board to which Winograd is answerable. Winograd is the man behind the curtain, doing as he pleases with the money that is donated to his personal "charity." ​Astoundingly, and somewhat suspiciously, Winograd opposes spay/neuter requirements and, in fact, has said that "as surely as pet overpopulation is a myth, the idea that the only way to a No Kill nation is through spay/neuter initiatives is also a myth." He purports to know better than those who actually work in the trenches, proclaiming: "If you ask 100 animal welfare professionals [how to end the need for euthanasia], all 100 would say spay/neuter. But all 100 would be wrong." In an interview that Winograd granted to the Center for Consumer Freedom (CCF)—which is run by dirty-tricks lobbyist Richard Berman and funded by KFC, Outback Steakhouse, Philip Morris, various cattle ranchers, and other animal-killing business interests—Winograd said that there is no overpopulation of animals—just "an overpopulation of lazy and complacent shelter directors." CCF must be laughing all the way to the bank! Winograd has also proclaimed that abandonment is the best way to handle homeless, unsocialized dogs. He states, "Looking to other nations for guidance, places where free roaming dogs are a far more common occurrence than in the United States … there is an answer: sterilizing and releasing community dogs, as is now done across the United States for community cats." Not only, however, is this proposed solution widely illegal, it also deliberately ignores what happens in countries with large populations of homeless, unsocialized, free-roaming dogs. For example, The New York Times reports that more than a third of all worldwide human rabies fatalities occur in India, where homeless dogs roam in large numbers. Joggers and bicyclists there throw stones and acid at the dogs and beat them. One group working with homeless dogs in India reports that maggot-infested wounds are the leading cause of death in street dogs, and paralyzed dogs drag themselves through the streets after being run over. If Winograd truly believes that abandoning animals to suffer and die on the streets is "the functional equivalent of adoption," where exactly did he learn the definition of "adoption"? ​Few people know that No Kill Advocacy Center does not rescue, shelter, or care for any animals in California or elsewhere. All its revenue and expenses are recorded on IRS forms available to the public, and right there, in black and white, Winograd reveals that not one penny goes toward spay/neuter surgeries, vet care, animal shelters, or rescuing a single animal. NKAC's 2014 Form 990 states that the organization "is working to end [euthanasia] of animals in shelters through direct assistance" and that it "provides … assistance to shelter staff [and] rescue groups," but in the section for reporting grants and other assistance to domestic organizations and individuals, there are just blank spaces and big fat zeros. While his well-meaning supporters donate their hard-earned cash to a cause they believe in, Winograd sits back, spews vitriol designed to stop people from supporting legitimate organizations, and watches his personal income flow steadily in—with not a red cent going toward helping animals. What a scam!